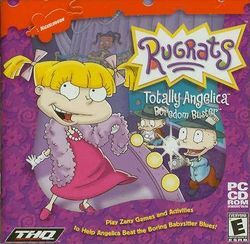 Rugrats: Totally Angelica Boredom Buster is a party game which was developed by KnowWonder for The Learning Company and released for Microsoft Windows on July 1, 2000; as the name implies, it is the tenth title for the Rugrats series, and the last that does not feature Kimi (Chuckie's stepsister). What's worse than spending the evening with a bunch of dumb babies? Having a boring babysitter who wants to yak on the phone all night! Hold on to your pigtails because Angelica has a few ideas on how you can beat the babysitter blues. You'll have so much fun, you'll want the babysitter to come back more often! Fit for a Princess: Complete Angelica's "Fantasy Face" by matching the look in the mirror. Angelica TV: Lights, Camera, Angelica! Create your own music video starring you-know-who using hip-hop, ballet, pop or disco music. Ice Queen: Help Angelica beat the clock with a full-on ice folly, but beware of those pesky barrels and banana peels! This page was last edited on 16 November 2016, at 15:40.